It seems I am the rare person with years of Lean management experience in industry and who is also a full-time academic that has written dozens of peer-reviewed research papers. I occasionally get asked the question: “Have your published papers have been influential?” You may have heard that half of all academic papers are read by no more than three people. Is that the case with the papers I have written? Here is the answer. 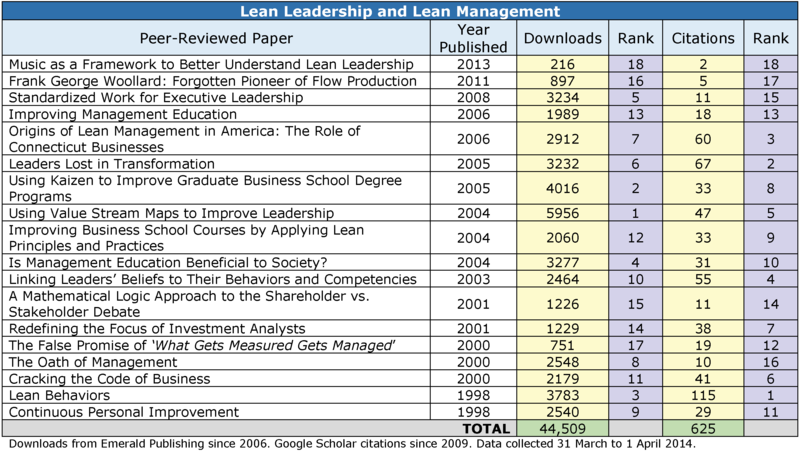 The image at right shows a list of my papers on the subject of Lean leadership and Lean management, sorted by year published (click here for full citations). Using the publisher’s data, you can see how many times each paper has been downloaded since 2006 and rank. Next to that column is the number of times each paper has been cited by other authors since 2009 and it’s associated rank (citations being an estimate of how influential the paper has been). You can see clearly that many more than three people have read these papers. 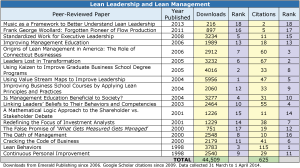 My seminal paper on Lean leadership, “Lean Behaviors,” ranks third in downloads and first in the number of citations for the population of papers shown. The paper with the largest number of downloads is another breakthrough paper, “Using Value Stream Maps to improve Leadership,” and ranks fifth in citations. Concurrently, I carried another line of research in supply chain management (ended in 2010), that focused on Lean supply chains and a zero-sum (win-lose) sourcing method, reverse auctions, that is inconsistent with Lean thinking and therefore a bad thing. 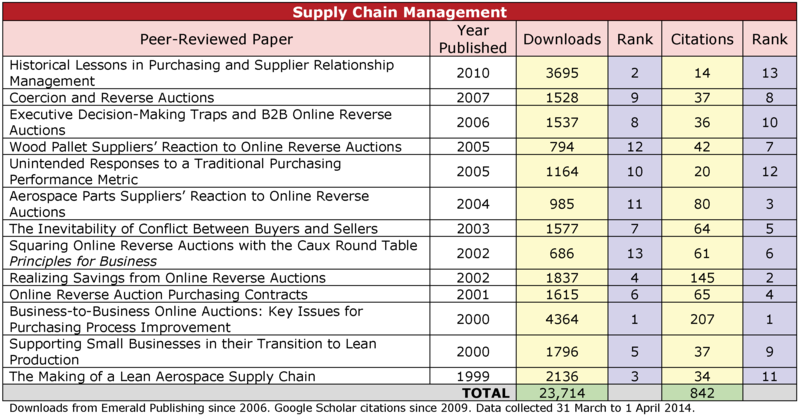 The image at right shows a list of my papers on the subject of supply chain management, sorted by year published, downloads since 2006 and rank, and the number of times each paper has been cited by other authors since 2009 and rank. Again, you can see clearly that many more than three people have read these papers. The first academic paper ever written on reverse auctions, “Business-to-Business Online Auctions: Key Issues for Purchasing process Improvement,” ranks first in downloads and first in the number of citations. The paper with the second highest number of citations “Realizing Savings from Online Reverse Auctions” showed how cost savings from reverse auctions were illusory. 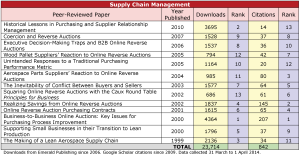 Finally, the paper with the second highest number of downloads, “Historical Lessons in Purchasing and Supply Chain Management” advocates for a return to non-zero-sum, win-win, supplier relationships as Toyota has long done (though seems to have strayed from in recent years). Early in my career I also wrote ten papers related to materials science and engineering, the subject of my Ph.D. When including these papers, a total of 35 of my papers have been cited 10 or more times, and 25 have been cited 25 or more times. Translated to the real world, this level of citations would qualify me as a big-shot in an prestigious academic association, such as “Fellow of The American Society of Important People.” I’ve never received such an accolade because my work is not concentrated in one narrow area as is normally the case for academics. My research is unusual in that has spanned three distinctly different subject areas – Lean management, supply chain management, and materials engineering, while my papers have appeared in journals spanning a wide range of topics such as leadership, general management, quality, management history, supply chain management, e-business, industrial marketing, higher education, and metals, ceramics, and composite materials. I am fortunate to have been able to pursue so many things that were of interest to me. And in each case I have been lucky to be on the leading edge of the subject, which has fed the interest of others. This is reflected both in the number of downloads and citations. It is nice to know that more than three people have read my papers and that they have been influential among both academics and practitioners.